As Mark Cross indicated in his article, when businesses strive to gain an even deeper understanding of their customers and redefine their value propositions, they realise that internal change is a pre-requisite to enabling the delivery of those better, customer-centric propositions. And this change often requires an internal power shift, such as a shift in functional decision-making power; a shift from vertical to horizontal collaborative power; and/or a shift from traditional authoritative power to knowledge-based insight / sapiential power. So let’s now look at the different ways in which businesses are getting closer to their customers, and how power might have to shift. Changing how the customer-facing parts of the organisation interact with the customer might only require changes within a function – such as rethinking the scripts for customer care teams, or how the sales team engages with the customer. However, these changes are often driven by greater insight from those tasked with analysing and understanding customer demand and experience. In these cases, the power shift is for the customer-facing managers to listen harder to and take guidance from those with the insights on data analytics. In the Pharma world, the Health Economics team is the rising authority influencing decisions. In FMCG it is the Customer Insight team. At its lightest, these insight teams offer advice. At their strongest, they drive strategy. But if the organisation is creating new propositions, the power shifts to those working horizontally, across functions so that more rounded decisions can be made taking account of the knowledge and opinions across a multiple set of disciplines. Here a programmatic way of working becomes more important than the functional hierarchy, in order to redesign the value proposition. I recall being an employee of a business who set up a big customer care change programme without building in better lateral working relationships between functions. It failed. Meanwhile in the retail sector, the rise in home delivery volumes has required a fuller understanding of product profitability which in turn needs Commercial, Marketing and Supply Chain functions to work much closer together, to respond profitably to customer demand. Then we have the more radical ‘ground-breaking’ changes to how you think and respond to your customer. And it is here that there can be some fall-out at the executive level. In our experience across a range of sectors, the consequences have been the same – the departure of an executive, who sees their power diminishing, and cannot buy-into the new order of things. This has occurred when a common acceptance has built up over the years to accept the dominance of one particular function / player, which is now challenged by the need to be directed by another part of the business to drive the customer-centric agenda. A Shift Away from Sales to Marketing: Counter-intuitively, getting closer to the customer for B2B businesses whose products or services ultimately reach a consumer, can mean a shift of power away from Sales – who might have previously had a freer reign to drive the commercial strategy. However, when the need is recognised to more fundamentally understand and engage with the end-consumer, then the authority of Marketing increases, to enable the business to become more brand-led. Here, Sales can go through a combination of emotions from being relieved in getting better guidance, to being upset for no longer being top dog. The Shift From Marketing to Supply Chain: The online channel has meant the rise in power of supply chain, for what was initially a new marketing and sales channel, that has subsequently driven the demand for home delivery. Argos for example have recognised, the battleground for the customer has moved from product (range, price, quality) to fulfilment (where and when), by committing to same day delivery whilst Amazon Prime have raised the bar with their delivery within the hour in London. With this consumer shift towards online, there have been various power battles on who calls the shots to drive both market share and prot. During these shifts, tensions can are up between functions as they adapt to the changing conditions. A Shift towards Sales & Marketing Business Units within Corporates: When the authority to drive the business is handed to Sales & Marketing Business Units, we often see that a focus and energy is unleashed that drives the group-wide operational services much harder. In this instance, care must be taken that the group services have the capacity, capability and motivation to respond accordingly, and that the business units do not mistake the additional authority for complete independence, and drive a too self-absorbed agenda that sub-optimises Group performance. 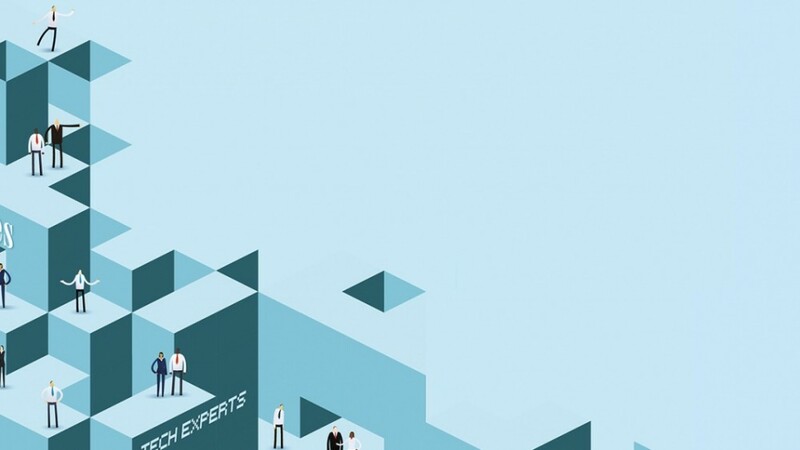 From Technical Experts to Customer Account Management: In technology / knowledge-based B2B service providers, the power historically has resided with the technical domain experts who tend to frame the world from their particular technical point of view and who hold resource-allocation authority. So by default they decide what takes priority. 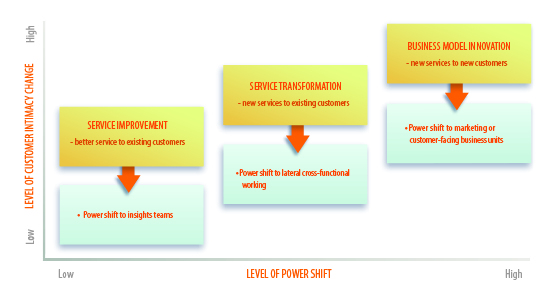 However, as the market develops and the customer matures from being in awe of the service provided, to demanding service improvements, this technical-centric view can inhibit business performance. This is when customer-facing roles who have a strategic relationship with the client, can better align internal priorities to the customer priorities. However, the transition can be painful, as the technical experts who previously had the power, initially resent the power loss, and then become demotivated. Making such significant changes can be problematic for the Executive Management Team, which has to adjust to the changing power relationships between executives. So if this is not addressed up-front, it can result in a lot of in-house wrangling, and counter to what was desired, cause a decline in customer focus and business performance. So how to manage this? Facilitation of the Executive Team is key to help translate the change in market conditions to changes in strategy and ultimately the operating model to get closer to the customer. This is done through exploring options and sensitively understanding the consequences on how decisions would get made, and who would have what authority. Mark Goodridge’s article covers this in more detail. In making the shift towards being more customer-centric there will be consequences for your operating model, and ultimately for the rules of the game about how decisions get made and who has the power to drive the business forward. This in turn has an impact on capability and motivation for those roles that lose power as well as those who gain power. So be careful – to realise your customer-centric goals might also require careful change management of your Executive. The last couple of paragraphs are so very true. Moving to a real customer centric organisation calls for not only changes in attitudes but cut across to decision making and budget considerations. For example, a truly customer centric organisation would put processes in place that can quickly ensure the customer experience takes priority. From my business (pubs and restaurants) it will be from how repairs are managed, costs allocated for consumable spend, proactive management of trip advisor to consistent and persistent focus on customer metrics and evaluation of what we are doing to influence those metrics. Alongside that has to be the focus on our teams and bottom up empowerment to enable our teams to make the best decisions for our customers every time in a way that is intuitive (with applied common sense) without fear of getting it wrong. As Gary has highlighted, this will absolutely lead to shift in power that some will find difficult to adapt to.